I spent part of the long holiday weekend rewatching an episode or two of HBO’s John Adams. Of course, being me, I love the scene that depicts the editing of the Declaration of Independence. If you’ll recall, Adams, Ben Franklin and Thomas Jefferson were appointed as a committee to draft the Declaration. Then, Adams had talked Jefferson into doing the actual writing, citing his skill with the written word and the fact that Adams himself was far too busy (aside from sitting on various committee, Adams was bearing the greatest share of the burden of arguing for independence, while Jefferson never opened his mouth during the debate). In this scene, Adams and Ben Franklin are getting their first look at what Jefferson has written, and reacting to it, and offering changes. Having been in this situation myself so many thousands of times with writers who sometimes regarded their words as perfect, I enjoyed watching the dynamics. First observation: Adams starts out by praising Jefferson’s work to the skies — a fitting approach given the document he’s editing, but one that is wildly at odds with my own approach. As Dave Moniz used to say when he worked for me, the highest praise I ever offered of writers’ work was “pretty good.” Maybe I should have tried this approach; it seems to have led to a good result. Nevertheless, Jefferson proves he’s not an automaton when Franklin (being a newspaper editor himself, Ben had a knack for this) finally gets a rise out of him, and Jefferson says, still in that cold-fish voice, “Every single word was precisely chosen. I assure you of that, Dr. Franklin.” To which Franklin, unfazed, essentially says yeah, that may be the case, but you don’t get the final word; we’ve got to get this thing through Congress. 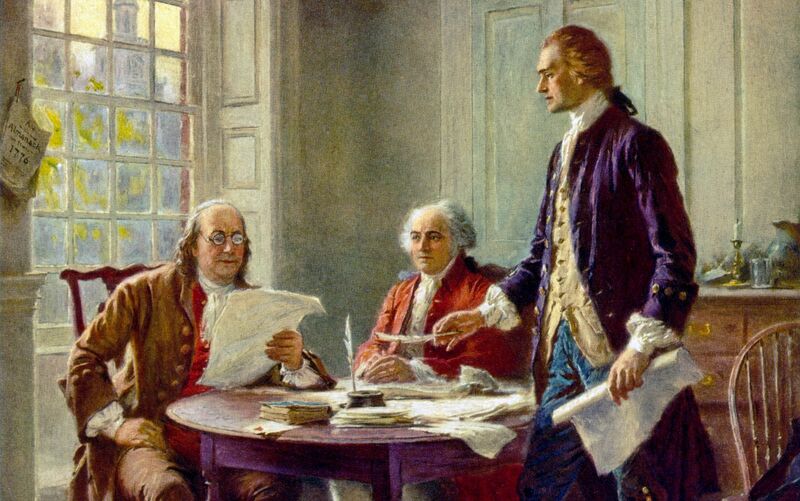 Adams was (in an unaccustomed role for him) cheerleading the document, while Franklin was determined to edit it. Normally, I’m an Adams fan, but in this case, it’s Ben I identified with. You can’t let writers get an exaggerated sense of their own importance. What do they think they are, editors? This entry was posted in History, Holidays, Marketplace of ideas, Media, Television, The Nation, Words, Working on July 5, 2017 by Brad Warthen. I remember that scene. I had remembered the line as “each word was carefully chosen” but I remembered it as soon as you started describing the scene. Interestingly some Trump supporters did not recognize Jefferson’s precisely chosen words yesterday. Yeah because I’m sure NPR is just chock full of Trump supporting subscribers. Let’s me try to understand… so you’re saying the Republicans complaining about NPR aren’t any different than the Democrats complaining about FoxNews? Weird. I have no idea. I don’t watch TV news, but I do know a good bit about NPR, and I’m familiar with the dynamics of social media and the way memes take off. Yep. Some people in the Congress would have rejected it just because Adams wrote it. I do believe you’ve laid a curse on North America. A curse that we now here rehearse in Philadelphia. A second flood, a simple famine. Or a cataclysmic earthquake I’d accept with some despair. But, no … you sent us Congress.